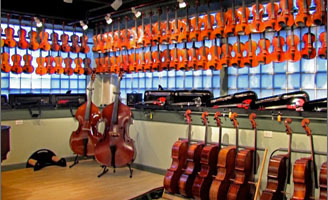 HC stands for Howard Core, the industry's leading manufacturer/distributor in the US. This line of cases is made in China to their specifications. The emphasis is on high value and light weight. 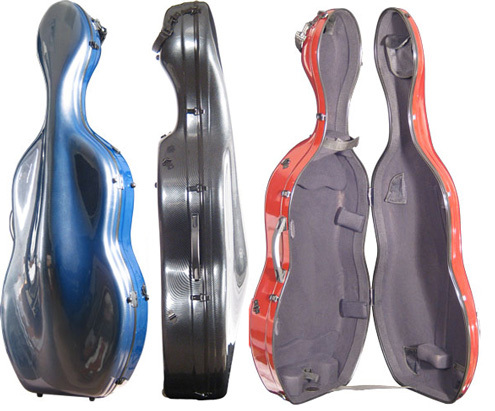 These cases are sold in literally hundreds of violin shops around the world. Continuous efforts are made to improve the durability, reliability and value of each model to ensure customers are well served by these models for years. 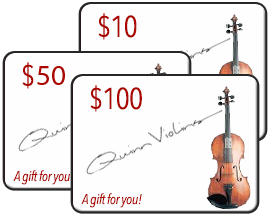 These models have a 1 year warranty for defects in workmanship and parts. 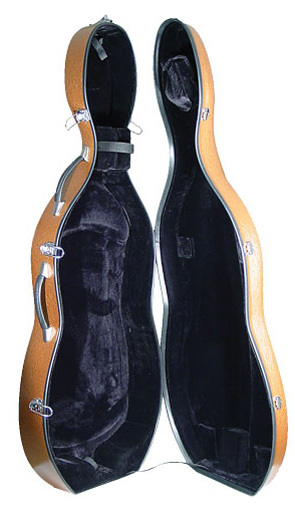 Fiberglass cello suspension case. Black fittings, two carry handles, backpack straps, pull strap and wheels for easy transportation. Interior features include black plush lining with suspension pads, accessory pocket and music pocket, two bowholders. 4/4 only. 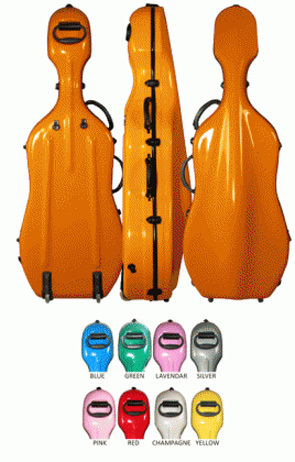 Composite shell cello case, with scratch-resistant exterior finish. 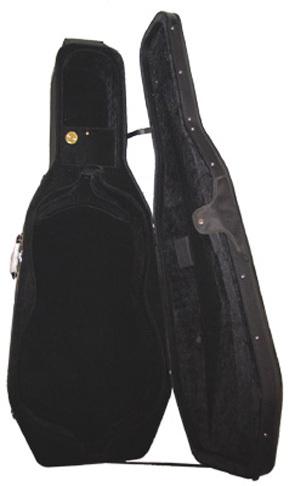 Black fittings, carry handle, backpack straps, pull strap and wheels for easy transportation. Interior features include black plush lining with suspension pads, accessory pocket, and two bowholders. 4/4 only. The black color appears at the left of this image. Affordable, nicely appointed case. Zipper closure, cordura exterior with large music pocket. Padded velour interior with two bowholders and accessory pocket. Inline wheels for easy transport! 4/4 - 1/4 sizes available. Weighs just 8.0 lbs! 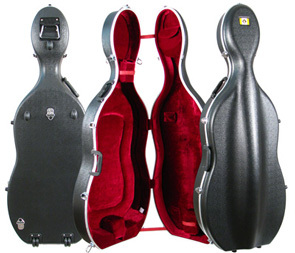 Full-featured hardshell cello case. Solid construction, wheels, hygrometer, super lightweight! German hardware. 4/4 - 1/2 sizes available. Weight 12 lbs. With integrated wheels. Nicely appointed with suspension padding, Two Bow holders. Available in 4/4, 3/4, and 1/2 sizes. Single latch hardware system. 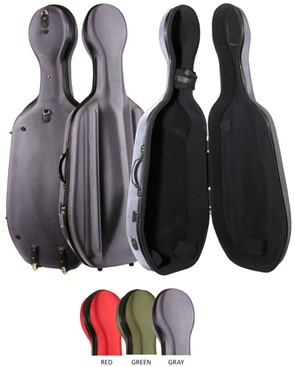 These carbon fiber suspension cases are attractive, lightweight, and easy to open. No more reaching and stretching - single latch operation makes this case easy to open (and keeps the case securely closed)! Leather carry handle and accessory pocket. Weight 8.2 lbs. Black, Blue or Red. This case has a fabric pull that attaches to the front of the case with a metal carabiner. Gray and Copper have a textured exterior finish, all other colors have a smooth finish. Weight 14.0 lbs. 4/4 only. Colors are Chianti, Pistachio, Pewter, Sunshine, Skyblue, Ebony, Copper, Metallic Blue. Wide range of bright colors. 4/4-1/4 sizes available. 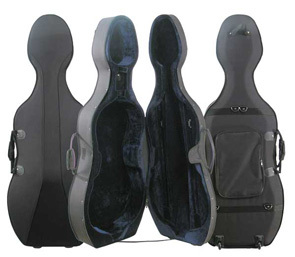 suspension padding, two bow holders, accessory pocket, 14 Pounds. 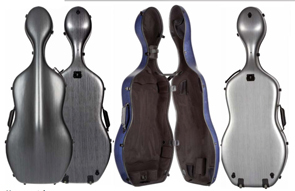 4/4 High-strength fiber-composite cello suspension case. Sturdy, well-constructed, with good hardware and tight weather-proof closure. Carbon weave exterior with black suspension interior featuring two bowholders and accessory pocket. 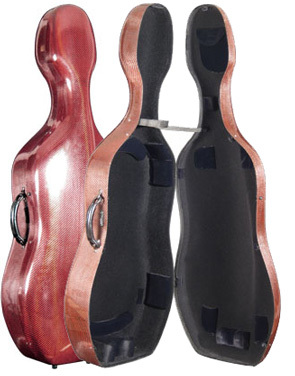 Includes backpack straps and detachable pull strap. 4/4. Weight 10.95 lbs. Black Only.